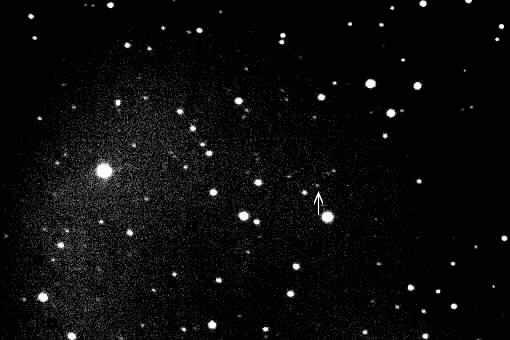 The image of a Near-Earth asteroid 2003 CP20 was taken on 2003 February 14.0 UT with 0.57-m f/5.2 reflector + CCD camera SBIG ST-8 of the Klet' Observatory and is 30 seconds exposure. The field of view is 16 to 10 arcminutes with north to the top and west to the right. Minor planet is arrowed. Minor planet 2003 CP20 is the first asteroid with a confirmed aphelion distance of less than less than the earth's perihelion distance of 0.983 AU. The object was discovered near its maximum possible elongation from the sun of 76 deg. The minimum possible distance from the earth is currently 0.19 AU.